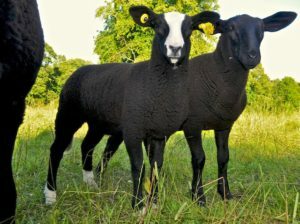 Here is a short video of some Zwartbles cross breed lambs. The ewe is a Texel/Suffolk X her black lambs are by a Zwartbles Ram. Here they are days old with some pure breed Zwartbles lambs of about the same age. I hope this video gives you some idea of what the cross would look like, as you can see they are quite hardy looking. Most Zwartbles crosses are pure black. We are hoping to get more information about Zwartbles crosses offspring.